Hello! It’s me – Briar! I am here to tell you a story about something interesting that happened yesterday. We were at home doing quiet things. Jane was knitting and watching the television, and I was resting because I’d had a very busy day. We have had blackbirds nesting in a hedge at the bottom of our garden. First we saw two blackbirds gathering things to make a nest. And then there were three eggs in the nest, and three little chicks came out. We saw the parents going out and about to find worms to feed the chicks. And the chicks grew into fledglings. Last night we heard a loud fluttering noise. Jane looked up, and she saw a fledgling flying straight towards us. 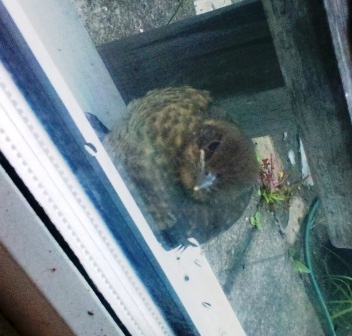 He crashed straight into out window – beak first! And then he dropped down and landed feet first on our window sill! He stood there for a while and we could see him looking around, but he did look a bit befuddled. Ten minutes later he was still there, and so Jane went out to move the little bench that we keep outside the window, to make sure that he could see his way out. That seemed to help, because he hopped down and he went to stand under the meter box, behind a watering can. Jane moved another watering can, so that he could still get out but cats or seagulls would find it difficult to get in. She says we can give nature a helping hand sometimes, but we shouldn’t interfere too much. By bedtime the little fledgling was gone. 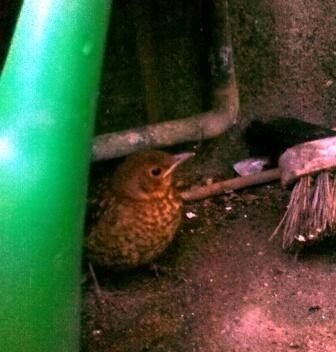 We didn’t hear any noise, so we hoped that he had been able to fly away and that he had found his family. Now all three little fledglings looked very alike and so we can’t be sure, but this morning we saw a fledgling on the wall, and this afternoon we saw one under the bush. He stayed there for a while, and then he flew off over the next few gardens with his mother. I think it was him. I hope all our three fledglings do well. And that the blackbirds come back to nest again next year – I do like watching them. Awww…what a heartwarming story! And I’m sure those little guys will be peeking in from time to time! This is such a sweet story. I love watching the wildlife in my garden, unfortunately for me my garden is not a haven for various animals at the moment, but this little tale brought a smile to my face.